Culebra is the lesser known of the two major islands that lie off the eastern edge of Puerto Rico. Vieques is the island Americans tend to think of when they think of an island vacation destination off the coast of Puerto Rico, both because it is larger and because of the more recent and public fight to stop the American military from using it for bombing practice. But the small island of Culebra, seventeen miles from Puerto Rico proper, is more than adequate for a relaxing beach vacation and it can easily keep a birder busy for several days as well. 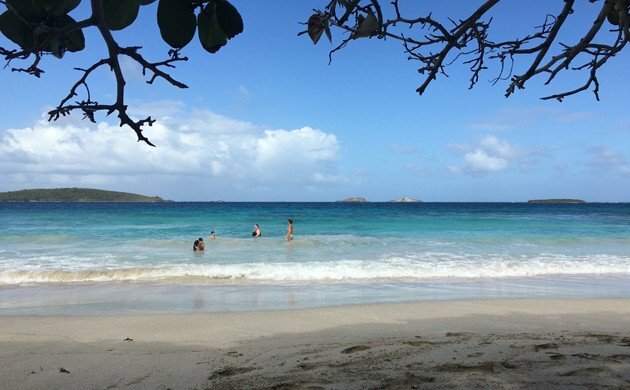 My trip to Culebra lasted from the early morning ferry on Monday, 15 February until the even earlier ferry back to the Puerto Rico “mainland” on Friday, 19 February. The trip was not a birding trip except that I am a birder and every trip involving me becomes a birding trip. I spent two early mornings dedicated expressly to exploring the island for birds, another early morning taking a walk around the neighborhood where we were staying, just east of the airport, looking for birds, and, of course, I brought my binoculars along and paid attention while we enjoyed the beautiful beaches and when we visited one of the even smaller islands off of Culebra, Culebrita. In the time we spent on Culebra I saw 49 species of birds, not bad for an island outside of the wintering grounds for most neotropical migrants and only measuring eleven miles square. February is not the ideal time for a birder to visit Culebra as the main attraction for birders there is the apparently amazing seabird colonies which are not yet active in the dead of winter. But, as I have mentioned, this was not a birding excursion but a beach vacation with the family and friends, so seeing seabirds was not high on the list of priorities when we planned the trip. Somehow I managed to survive the deprivation with the help of 85-degree days, rum punch, and the fact that, you know, I was on a gorgeous tropical island. Before we get into the details of what birds I saw and what birding spots seemed to be the best I thought I would share some general impressions about Culebra. Getting there can be a bit of an annoyance, as the ferry terminal in Fajardo is an expensive taxi ride from the San Juan airport and is pretty chaotic. If you can find a way to ride the freight ferry you should as the passenger one has no open decks and the windows are too high to comfortably peer out of them while seated. The freight ferry has an open deck on top which aided greatly in getting good looks at Brown Boobies and Red-billed Tropicbirds on our ferry ride back. A young Brown Booby buzzed the boat on our way back to Puerto Rico. This made me very happy. Of course Culebra is beautiful and Flamenco Beach might be the prettiest beach I have ever visited. It is also a very small island and the grocery stores are expensive and not great. That said, the restaurants leave a bit to be desired as well: you don’t go to Culebra for fine dining, you go for the beaches. Eat for energy, not for epicurean delight. The ubiquitous beer is Medalla Light which is fine as far as light lagers go. It can be purchased for a mere two dollars a can at the marvelous stands at Flamenco Beach or even cheaper by the case in any of the grocery stores. If you go to Culebra you will be astounded at the sheer number of outdoor cats and chickens. I have never been anywhere with so many cats in my life. I can’t imagine the damage they must inflict upon the native wildlife. The chickens were amazingly frustrating as the roosters often started crowing at 2 AM and didn’t really stop until well after dawn. Mosquitoes were an occasional issue and if you are sensitive to their bites you might end up with some unsightly lumps. There are a variety of lizards on the island, including some huge iguanas in the mangroves but I saw no snakes despite the fact that Isla Culebra means “Snake Island.” White-tailed Deer have been introduced but no one in our group picked up any ticks. Sea turtles can be seen from the beach or while snorkling at Tamarindo Beach, especially if you go early in the morning. Scaly-naped Pigeons are easy to find anywhere in Culebra. 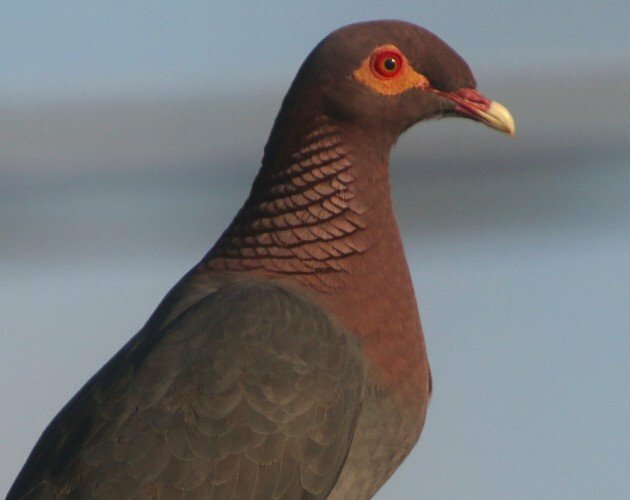 Of all of the wild birds on Culebra the most visible and common are Columbids, or doves and pigeons. I spotted eight species in my time on Culebra. White-winged Dove, Scaly-naped Pigeon, and Zenaida Dove were exceedingly common and impossible to miss all over the island. Common Ground-Doves were also common but flighty and less willing to sit up in the open as only makes sense for a dove with “ground” in its name. Mourning Doves were sparse, I only had a few and two of those were actually on Culebrita. A flock of Rock Pigeons can be seen wheeling over the small airport and Eurasian Collared-Doves are generally found only around the more densely inhabited areas of the island. On our first day on the island I had a trio of White-crowned Pigeons perched up next to the grocery called Milkas, just south of “the bridge,” which is the only bridge on the island, so I had high hopes of getting good looks and pictures of the species later in the week but they turned out to be the only three I would see during our time on the island. This Gray Kingbird had to fend off several other hungry kingbirds while it bashed this bug until the wings fell off. Gray Kingbirds rivaled the pigeons and doves in terms of being the most visible and numerous birds. 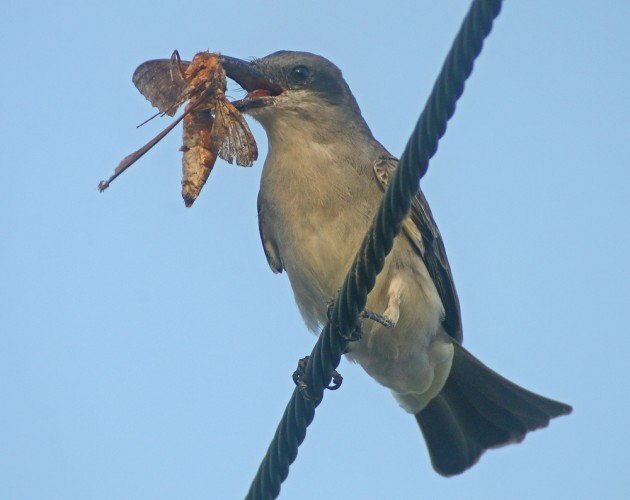 I constantly tried to turn them into Loggerhead Kingbirds, which are supposed to be present on Culebra but never had any luck. In fact, other than on Culebrita, where Caribbean Elaenia are common, I saw no other species of flycatcher. I couldn’t believe how many Clapper Rails were in the mangroves along 250. Waterbird variety wasn’t huge but it was interesting. Of herons and egrets I only saw two species. Cattle Egrets were easily found in any open areas, particularly around the airport and the eastern end of the island. Little Blue Herons were sparse but I saw one at Melones Beach (also where I had my only tern of the trip, a Royal Tern) and a couple of others foraging in mangroves. 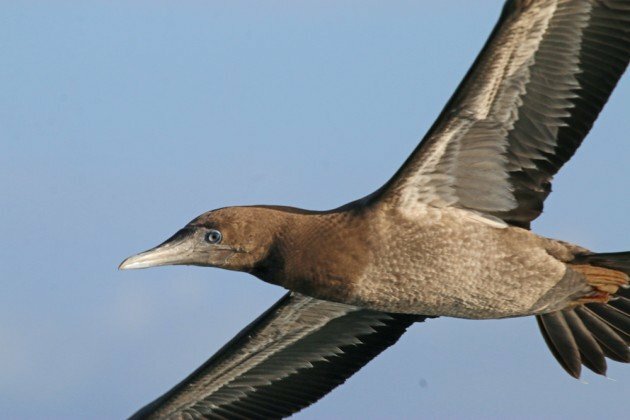 Magnificent Frigatebirds and Brown Pelicans are easy to find, just look up regularly and you will get them. 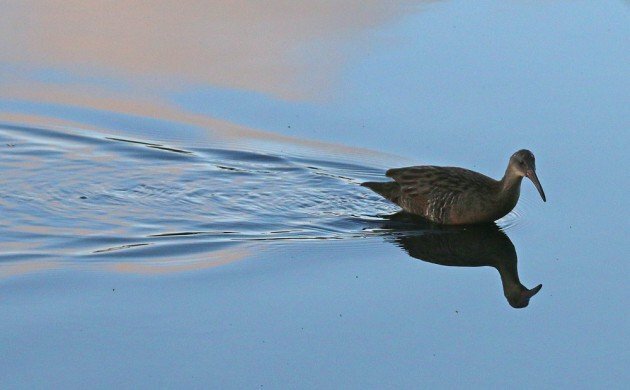 Of waterfowl I only saw two species, Blue-winged Teal and White-cheeked Pintail. The were more than a score of pintail in Flamenco Lagoon and several others were found frequenting the mangroves along 250, which is also where I found the couple Blue-winged Teal I saw for the trip. Clapper Rails were amazingly abundant in those same mangroves. On the two morning I visited I heard or saw eight the first day and ten the next. Once, I had four in sight at once! In addition to the clappers, I had a couple of Common Gallinules to round out my rallid sightings as well as my only Belted Kingfisher of the trip. Both Flamenco Lagoon and the mangroves along 250 were the best places for shorebirds as well, with the former being the best spot: I had Greater Yellowlegs, Lesser Yellowlegs, Black-necked Stilt, Stilt Sandpiper, Semipalmated Plover, Wilson’s Plover, Ruddy Turnstone, Semipalmated Sandpiper, and Spotted Sandpiper. The most numerous were the Black-necked Stilt and Stilt Sandpiper. To get firm identifications on most of the smaller shorebirds at Flamenco Lagoon I had to use my spotting scope. For access to Flamenco Lagoon, which is ringed by a solid wall of vegetation, I found I just had to drive slowly until I found a rough path down to the lagoon’s edge and then pull over onto the shoulder and walk down to the water’s edge. Most of the shorebirds were congregated in the northeastern corner of the lagoon and the best viewing I could find of them was along 251, a bit west of the southeastern corner. The only other shorebird species I had was a pair of American Oystercatchers on the rocky shore at Tamarindo Beach. Yellow Warblers are a sweet bird to see no matter if they are permanent residents or migrants. Neotropical migrants were seriously lacking, with only Prairie Warbler and Northern Waterthrush definite wintering passerines. I had Yellow Warblers here and there, especially on Culebrita, but it seems likely that they were resident birds. A couple of Barn Swallows went over one evening for my only swallows of the trip though Cave Swallows are supposed to be permanent residents on Culebra. I guess I wasn’t in the right spot to see them! As for raptors I had one brief look at an Osprey and saw several Red-tailed Hawks but nothing else. Not even vultures. Pearly-eyed Thrasher was a more-than-welcome life bird! Resident songbirds were small in number but pretty darn cool. 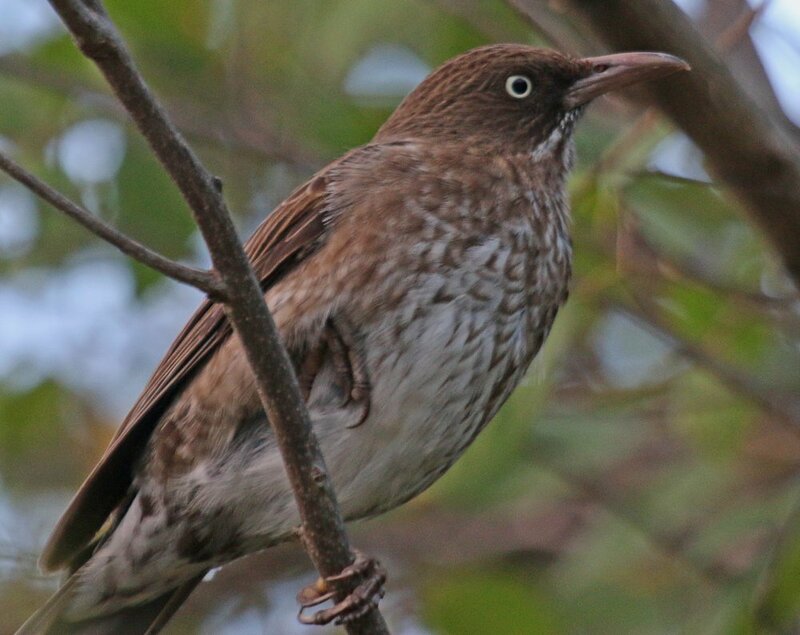 Pearly-eyed Thrashers are simply awesome and were virtually ubiquitous across the island. They readily respond to spishing. Bananaquits were everywhere too and once your ear gets used to their calls you will realize just how common they are. Black-faced Grassquit are also quite common and easily identified because there is nothing to confuse them with. I was pleased to get eye-level, unobscured, and short-range views of a Mangrove Cuckoo one morning when, of course, I only had my binoculars with me. I also heard them a couple of times and I imagine that they are pretty common though typically skulky. Smooth-billed Anis were relatively common throughout the island but Greater Antillean Grackles were conspicuous by their absence. And, of course, there were House Sparrows in town but I didn’t see a single starling the entire time! 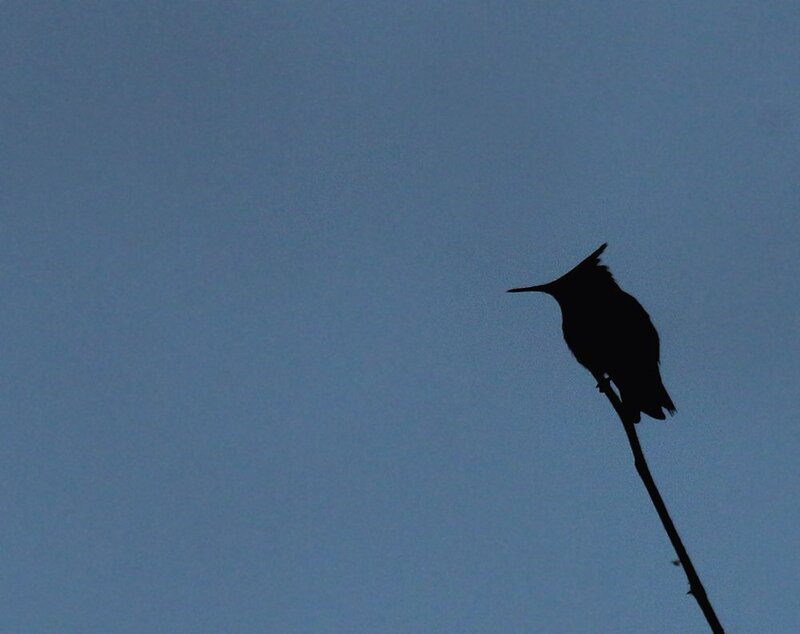 Antillean Crested Hummingbird is easy to identify, even as a silhouette. Three hummingbirds can be found on Culebra and I spotted all three. Antillean Crested Hummingbird was the easiest to find though Green-throated Carib and Antillean Mango weren’t too tough. Staking out flowers seemed like the best bet and there was a flowering tree by the bathrooms at Flamenco Beach that served to attract hummingbirds (and Bananaquits) regularly. 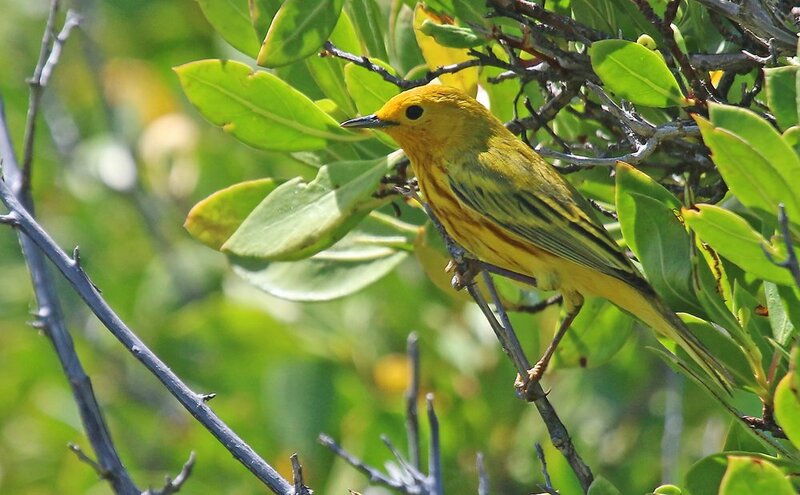 All-in-all, the trip to Culebra was well worth the effort and it is an ideal destination for a family trip that includes a birder or two along with non-birders. The island is small enough that you can get anywhere within fifteen minutes and the birding hotspots are easily covered quickly. There are enough new birds to keep a North American or European birder interested without there being so many that you feel you are missing a ton while spending your afternoons lounging on the beach. I highly recommend a visit but you should be prepared for those damned roosters! 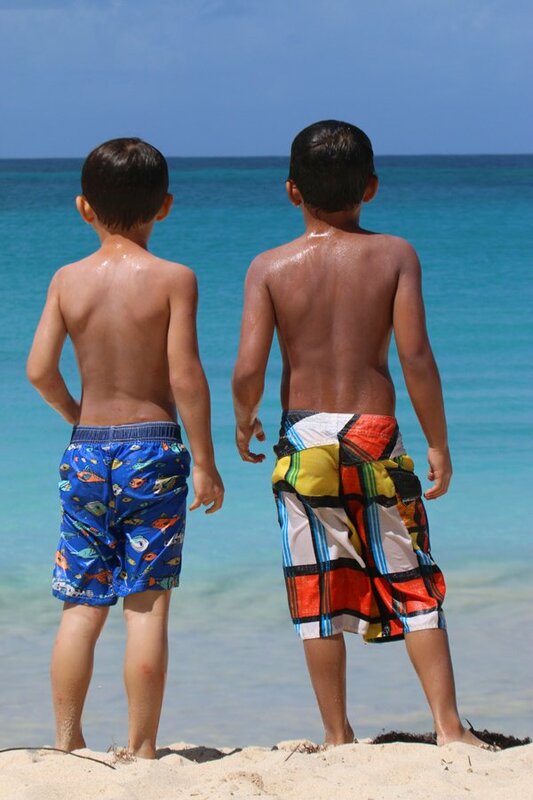 Desi and his buddy Javi had a great time on our Culebra trip! Great to hear about your vacation! Thanks for being honest about the downsides like lots of cats and roosters!